EMAIL migration must allow complete transfer from one email service to another; you need for an IMAP migration tool that supports a standard EML file format for messages. Handy Backup provides such email migration tool for most standard and exotic mail servers, to migrate messages freely. How to Make Email Migration with Handy Backup? Please use the next simple instruction for using Handy Backup as your email migration service. 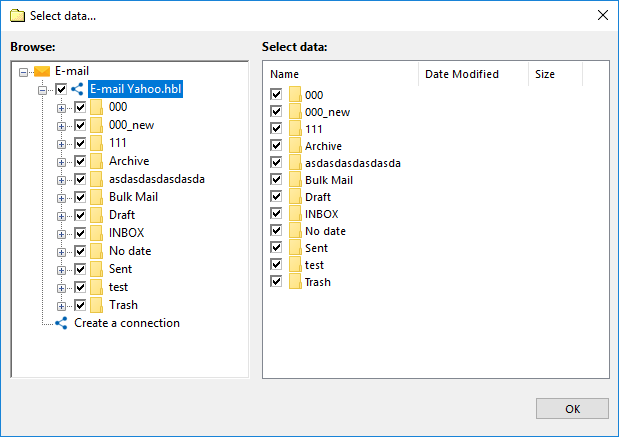 For this example, let us assume that you are using the Yahoo Mail account and migrate it to the Microsoft default email, using Handy Backup as Outlook migration tool. Note: Do not make a mistake by referring to "Outlook migration" as email migration of Microsoft Outlook local content! In the context of this article, the "Outlook" is the Outlook.com mail service, not a local mailing and event-controlling utility. 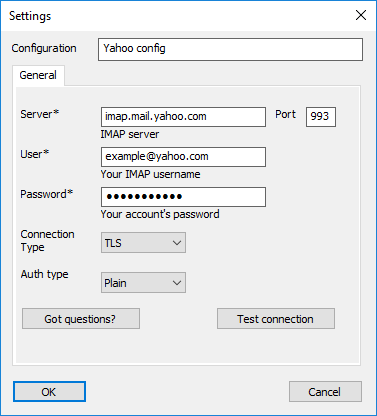 In your favorite browser, open the web interface for both your email servers (e.g., Yahoo!Mail and Outlook.com), and enter into your accounts on both servers. In account settings on both services, check flags or click buttons that allow using an external (local) email client. 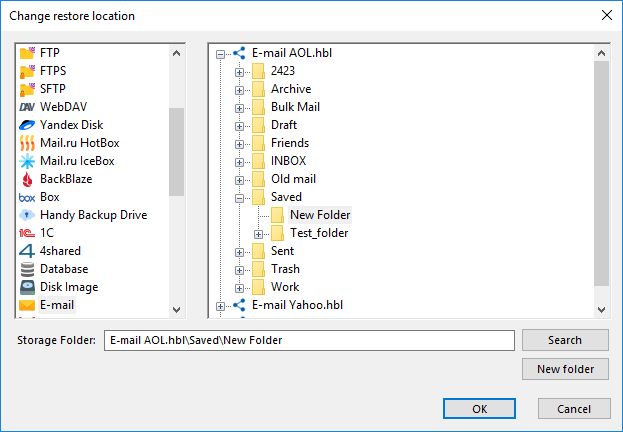 Also, please check that your local temporary folder (which will provide storage for migrating messages) has enough space to store your email account content. Open Handy Backup and create a new task by using a button or a menu. Select backup task on the Step 1 and click "Next". Open the "Email" group on the Step 2 (left panel) and click onto a "E-mail" plug-in. Now click the ">>" button, or just double-click on "E-mail". In the appearing dialog, double-click "Create a connection". You will see a connection dialog for the "E-mail" plug-in. Enter all parameters to connect the mail server to migrate from. You can find the set of required parameters on the service help page, or via the Internet. Click OK and return to the plug-in window. Select the messages and folders by checkboxes for making a migration. Again, click OK, and then click "Next" to go to the Step 3. Here, select your temporary folder by using the "Computer" plug-in as your backup destination. Now click "Next" until you will reach a final Step 8. Here, give a name for your task. Start a task manually after clicking "Finish", or mark an option for immediate start on the Step 8. Wait until your task will complete. Excellent! Now we have backup of your emails in your temporary folder! Now it is time for moving these messages to another location! Create a task as described above, but select a restoration task on the Step 1. On the Step 2, select a file backup.hbi from your backup folder in local temporary directory. Proceed to the Step 3. Here, click the "Change location" button. In the appearing dialog, you must select the "E-mail" plug-in and a particular connection. If a connection for your destination server does not exist, create it as described above. 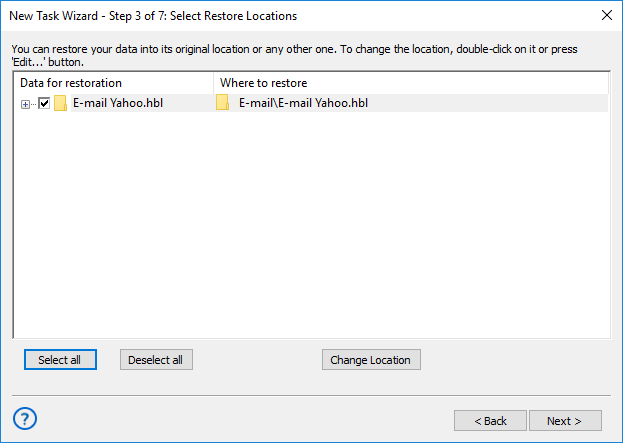 Select this connection as the restoration place for email migration. Click OK and return to the Step 3. Now, click "Next" until the final step. On the last step, give a name for your task and run it. Your emails will migrate where you say! 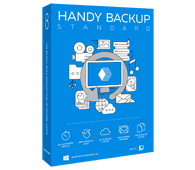 Starting with a lightest and simplest Standard edition for home users, all solutions from Handy Backup contain a plug-in and a complete set of additional tools for email migration! With the same "E-mail" plug-in for all email migration actions, you can move your messages between almost any services ever existing. Storing your data in a typical, readable "EML" format also allows you sorting, browsing and even manually restoring messages, as well as migrating to some local clients. Besides the advantages of using secured IMAP protocols for most services to make a reliable email migration, you can add to overall data security by choosing a well-defended storage type (an SFTP/FTPS server, Amazon S3 or Dropbox cloud, an external USB drive etc. ), and to encrypt your emails. 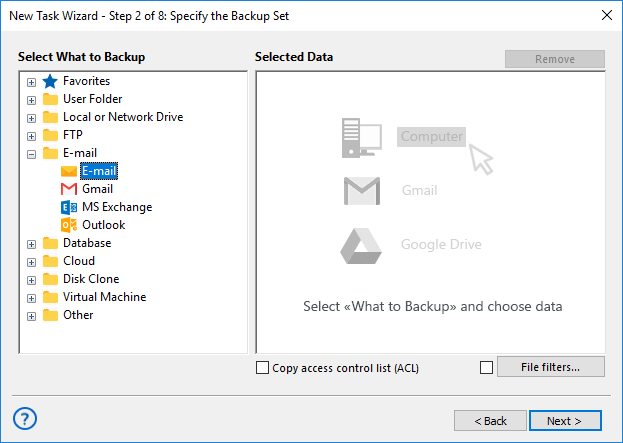 Finally, Handy Backup provides a big list of additional options, from scheduling your email migration by an exact time and a repeating period to running as a Windows service (with user notifications sent by email) to use separate tools (such as Gmail migration tool) for quick and easy setup of some tasks! Note: For Gmail migration, you can also use the dedicated "Gmail" plug-in with pre-defined settings for easy task setup. Try Handy Backup as your email migration tool by downloading a 30-day trial version with all plug-ins and settings available!